REA McGee are delighted to present this three bed mid terraced located in the popular Kilnamanagh. This property will appeal to a family looking for a generous home. Accommodation briefly consists of; entrance porch and hallway, living room, kitchen/ dining room, upstairs two double bedrooms, one single bedroom and bathroom. 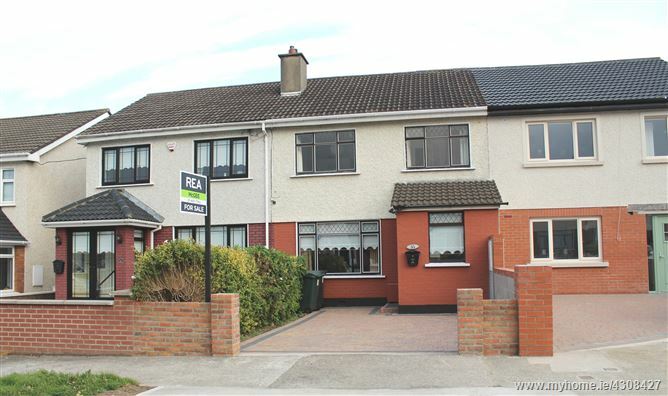 The property is located off Mayberry Road, Kilnamanagh in close proximity to Kilnamanagh Shopping Centre, Kilnamanagh Family Recreation Centre and schools. Just a short drive to Belgard Road & Greenhills Road with access to N7 and M50 motorway network. Serviced by Dublin Bus Routes and Kingswood LUAS, Tallaght Hospital, Tallaght IT and sporting facilities closeby. Entrance porch, carpeted hall, stairs and landing, under stair storage. Reception room with feature fireplace and large window, semi laminate floors. Kitchen area with fitted floor and wall high glass cream units, plumbed for washing machine, laminate floor, dining area with access to rear garden. Master double bedroom to the front of the property, laminate floor. Double bedroom to the rear of the property, fitted wardrobe, laminate floor. Large single bedroom to the front of the property, laminate floor. Rear Garden: Low maintenance rear garden, laid with stoned area and feature paving.